It doesn't use the MC34063, which is my new go-to DC-DC converter, because the output current requirements are too high for the 63's built-in transistors. 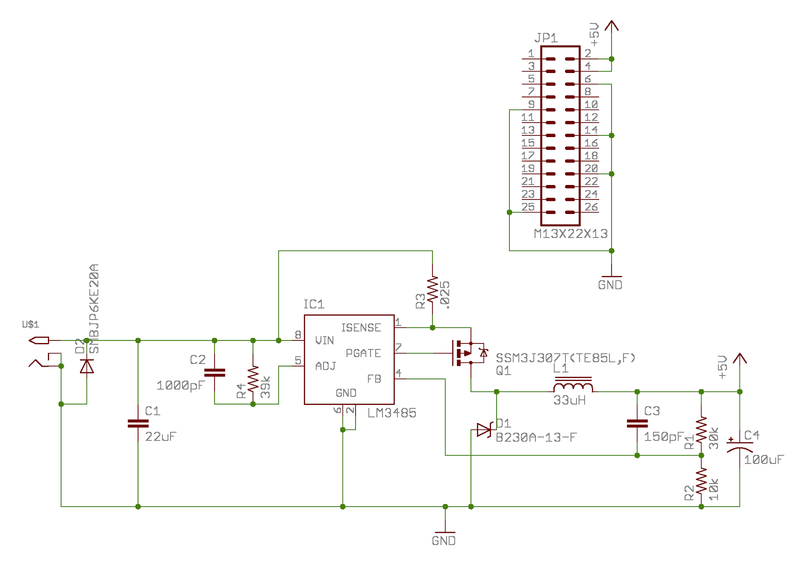 Instead, I've gone with the LM3485, which is quite similar except that it controls an external power MOSFET, and it's an SSOP rather than an SOIC package (probably because it doesn't need the extra surface area to dissipate the heat from the internal current switch). C2 is the main difference from a typical 34063 buck converter design (along, obviously, with the external Q1). It's purpose is to 'soft start' the current limiter so that the startup current doesn't trigger a shutdown. I expect the first prototype to be done mid-month. Oops... Just noticed... L1 is a 15 µH 5A inductor, not 33 µH. One more correction... V0.2 boards will change the MOSFET to a SI3443CDV-T1-GE3 for improved thermal performance.